After all the happenings in Karnataka ends now the BJP will focus on Telangana. The party will now gearing up for the polls in 2019. BJP president K Laxman said “Recently, a meeting was held in Delhi under the leadership of president Amit Shah ji. He focused on Telangana. The Legislative Assembly polls in Telangana will be held simultaneously with the Lok Sabha elections in 2019. He added that now the focus will be on Telangana, Andhra Pradesh, West Bengal, Orissa. Shah is likely to visit Telangana next month to assess the political situation and plan for the elections, he said. Laxman said the BJP will adopt the model of constituting ‘Panna Pramukhs’ at polling booth level to strengthen itself in the state. ‘Panna Pramukhs’ is a successful model followed by the BJP in different states in which the incharge of a ‘Panna’ (literal meaning page) reaches out to the voters’ families who are part of his list. The party is taking other steps as well to boost its organisational strength in the state. 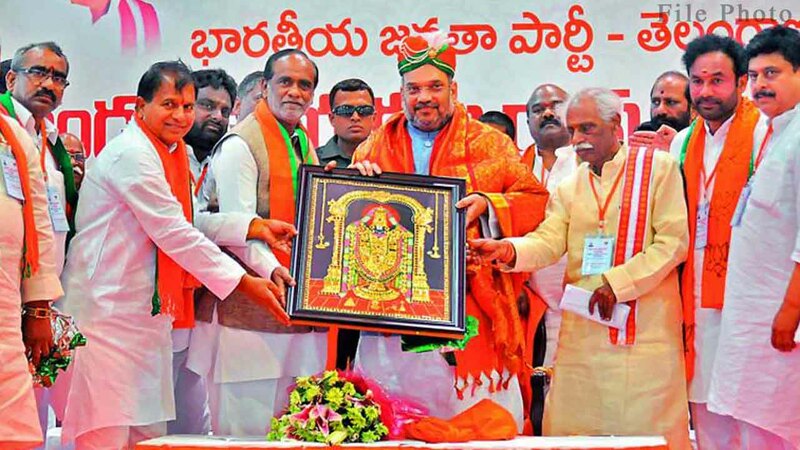 BJP would go to the people highlighting the achievements of the Narendra Modi-led government, the funds given by Centre to Telangana in areas like highways, railway projects, Ujwala (free gas connections scheme), he said. The party also highlight the alleged failure of TRS government in Telangana to keep its promises, including employment generation, providing two bedroom houses to poor and distribution of three acres of land to Dalits, he added. The BJP leader said the party would come out with a clear manifesto for various sections, including SCs, backward classes and youth after holding discussions with all sections of society in the state. BJP General Secretary Ram Madhav, Union Minister Narendra Singh Tomar and Bihar Minister Mangal Pandey have been given charge of the 17 Lok Sabha seats in Telangana and they would visit the state. The three-day-old BJP government in Karnataka had collapsed on Saturday, minutes before the scheduled trust vote, with Chief Minister B S Yeddyurappa resigning in a tame anticlimax to what promised to be on the edge of seat political thriller.